News, Reviews & Tips for (almost) all things Tech! Have HTC future-proofed the official car cradle for the One? 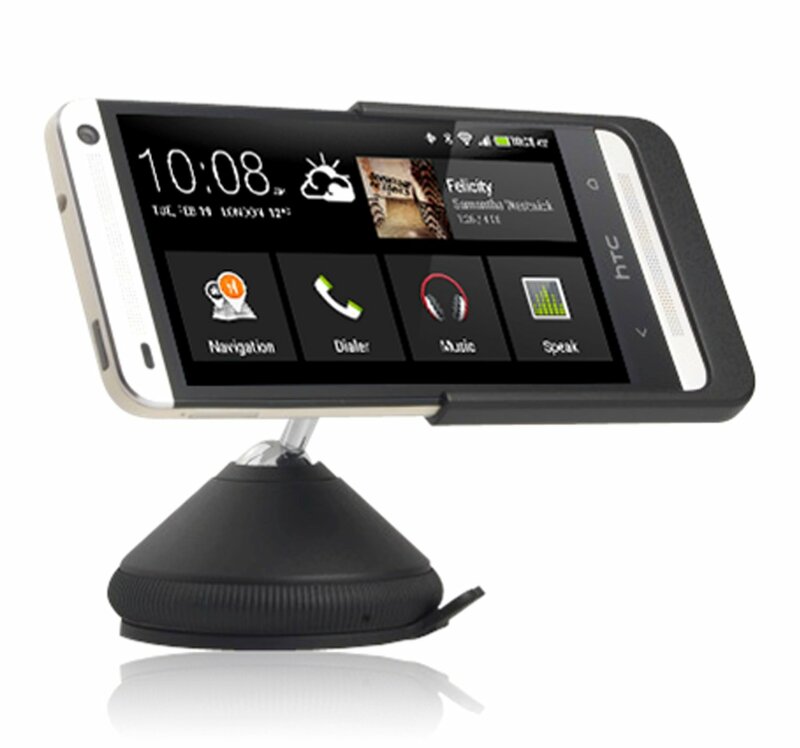 A while back I reviewed the official HTC In-Car Smartphone Cradle for the HTC One. In my review I mentioned the fact that the part which holds the phone to the arm of the cradle actually detaches when twisted. I suggested this may be so that it could be used as a basic case or possibly in case of breakage it being a simple part to replace. However, I’ve recently been wondering if this is in design to be able to offer replacement ‘holders’ for varying devices? With the announcement of ‘The All-New One’ looming, could we also see them announce that a replacement holder will be available for those who already have the original car dock? This would certainly be good for the consumer if it were the case. We’ll just have to wait and see, but as an owner of the original, I’d much rather pay £10 to replace the holder than fork out another £45 (original price). I will be attending the London launch on the 25th March for HTC’s newest flagship where I will no doubt be tweeting… Especially if my prediction comes into fruition. You can use any micro-fibre cloth you may have handily available to clean the screen. As for applying the protector, I would recommend getting a credit card (or something similar) ready. Then Remove the top part (maybe 1cm) of the backing cover on the protector and carefully attach this to the top of the phones screen. Now work your way down the screen slowly pulling the backing cover up and applying pressure in the fold with the credit card to push any air bubbles out the way and ensuring a clean and full application. Take your time! It may take a few minutes to apply, but done right this will ensure you have no dust/dirt or air pockets in between the screen and protector and will make this seem like an invisible protection. There are plenty of visual guides to applying these protectors on YouTube if you want to have a visual aid. As for the product itself, after following the guide above I’ve found that the protector does not stick fully in the corners. Whilst in the most part your screen will be protected it doesn’t look like a clean fit against the screen and to this I have removed it. I’m afraid to say that for an official product this doesn’t quite meet the mark. Great packaging and just the right size for the product itself. In the box you get the Car Holder with suction mount, a separate disc with sticky pad so you can stick this to your dash/interior and can then use the suction mount against this if window mount is not feasible. A Car charger (for cigarette lighter) and USB cable which is specifically designed with clips so the to secure it to the mount. Lastly, a user guide with multi-language instructions detailing how to fit the carkit and operation. The main bulk of the car kit is a great quality plastic and looks very good. I like the fact that the suction section is twist-to-stick as opposed to most previous mounts I’ve had which have a tough clip to secure the suction which looks unsightly. 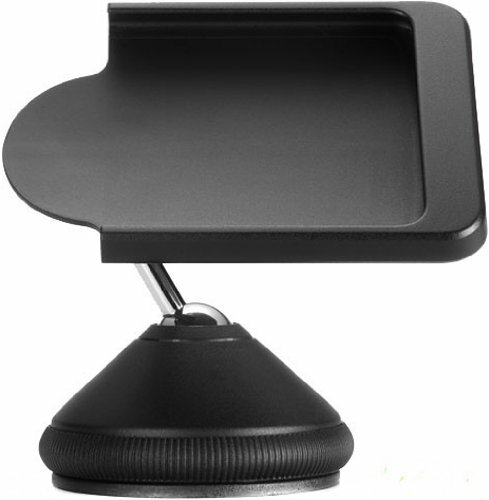 This gives the mount a clean look with no unobtrusive parts. 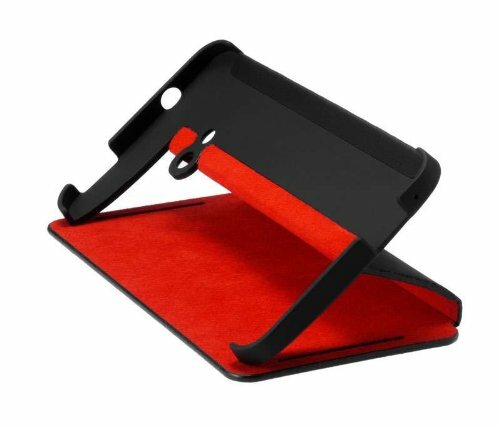 The overall size is 9.5cm from base of the suction section to the outside edge of the phone cradle. The phone holder is 7cm in width and 10cm in length, so when adding the phone in you’ll need a space of about 12/13cm lengthwise. There are 2 ball joints with a connector rod about 2/3cm long. These parts are made from polished silver to give that expensive feel to it. One ball joint is in the suction section and the other on the rear of the phone cradle. This is to enable you to easily swivel the direction of the phone to pretty much any angle you wish… Out of all car kits I’ve had this is a great feature and much better than any previous clip/unclip angle finders which are far more limited than this ball joint mechanism. The joints are fairly stiff to manoeuvre, but easy enough that it won’t cause any problems angling the phone to how you want it. This means that there should be no worries about the angle moving as you drive or hit bumps. In my opinion this is the perfect balance between stiffness & maneuverability. The Cigarette adapter isn’t the smallest or cleanest I’ve seen with some protrusion out of the lighter unit by about 3cm, adding the extra from the USB cable end you have to allow for at least 6cm before you get to the flexible cable. It may have also been nice to have a dual USB output, but the single output is fine for my needs and the plastic top has a matt finish to it, while the main body is a shiny plastic. Other than that it is a standard USB sized output, so could be easily used for charging any other USB device. The supplied cable is around 180cm in length so you should have no problems reaching from the cigarette lighter to wherever you decide to place the mount. Excess cable is suggested to wrap around the silver arm, and there is a space in the suction removal pull tab to hook the cable into to keep it neat and tidy. One end is the standard larger USB and the other end comprises of the smaller micro-USB plug protruding from a small clip which allows this to be securely fitted to the phone cradle. As the plug is protruding, it is entirely feasible to use this for any device which uses the micro-USB connector as a charge port and does not limit you to only having this for the specific use intended. I have fitted mine to the car using the supplied place pad. Suction is really strong and you can move the angle with ease without any risk of it coming loose. One point to note is that if you turn the phone holder clockwise it can detach from the rest of the unit. I’m not sure of the reason for this, maybe so it can be used as a temporary phone case. However, I wouldn’t suggest this be used as it’s not as sturdy as official phone cases. I would like to see this section be offered as an additional accessory in case of breaking as it is just plastic. The phone slides snugly into the cradle, sometimes I’ve had to tweak the charging pin slightly to get it to connect. But it’s not too much of an issue, and isn’t too hard to accomplish. Once the phone is in situ it’s easy to manipulate the phone to the right angle if you’ve knocked it out while inserting the phone. Bluetooth is automatically started, a connection to the handsfree made and the Car Home application loads (unless told not to from within the Car Home app settings). By default the main screen shows you large image of clock and weather – These are non-interactive so you cannot adjust any clock settings. There is a large button displayed to show you the ‘last played/playing now’ track and several buttons for sending you straight to Navigation, Dialer, Music, Speak, People, Settings, Exit and a ‘+’ button to allow you to add a shortcut to any app you have in your drawer. I would have like the option to add widgets to the Car Home screen as you have multiple screens which you can easily swipe to. Other than that the buttons are clear and easy to access at a quick glance. It seems that HTC have really tried to provide several levels with this app and not just let the buttons take you to the relevant inbuilt application. i.e. when you press “Dialer” you get a dialer with larger buttons to make it easier while driving. Pressing Navigation takes you to a screen with multiple (large) buttons to either go straight to Google maps, Previous Destinations, Appointment locations, Gas stations, Restaurants etc. It even has the option to go by photo, using the location info from the photo’s in your gallery (if available). Speak is interesting. It’s quite clever in so much that when you press this button it simulates a call to itself so that you actually speak and hear with your handsfree for the voice commands rather than using the phone’s inbuilt mic & speaker. One issue I’ve encountered is if the voice command fails sometimes the call remains active and you have to manually end it. Other than the few little issues the app is really good. Screen stays on while docked so you don’t have to keep pressing the unlock button on the phone. The app works like a launcher so you cannot press the home button to exit it which is a little annoying if you want to access any other apps while the phone is docked, but I can see the reason for this. Handily when undocking the phone Bluetooth is disabled, so be careful if you’re in a call on your handsfree and want to continue the conversation while in the car after stopping. This is a great quality accessory, build is exceptional which is what would be expected for an OEM product. Slightly dearer in cost than some multi-purpose carkits, but you get what you pay for with this. But if you’re getting a One and want to extend that luxury feel to the car environment you certainly would not go wrong purchasing this product. Looks-wise it stands out from the crowd and should have the envy of everyone who sees it. Only negative is really to do with the charging adapter. I would have liked this to sit as flush as possible in the cigarette lighter unit as is possible with some other adapters. To this end I may purchase a smaller adapter to make things as neat as possible. The case in the most part on the outside is made from a leather like material to give it an expensive feel and look, there is the “htc” name pressed into the front flip. This wraps around the main body of the phone to the back. The wrap-around although material feel to touch, is surprisingly quite solid with some pliability but not enough to feel like it would not support the phone during an impact. A good balance in my opinion. The top and bottom parts (as well as camera lens/flash cutouts) are made of polycarbonate to ensure if dropped this maximises the protection offered, these edges wrap around the corners of the phone holding it in place as well as giving protection if dropped onto the side. There are extra cutouts for the speakers to allow uninterrupted BoomSound, and cutouts for the USB port, mic and power button. The right-hand side of the phone is left open to the elements, but if it were dropped on this side, the polycarbonate edges should minimise impact with the surface. 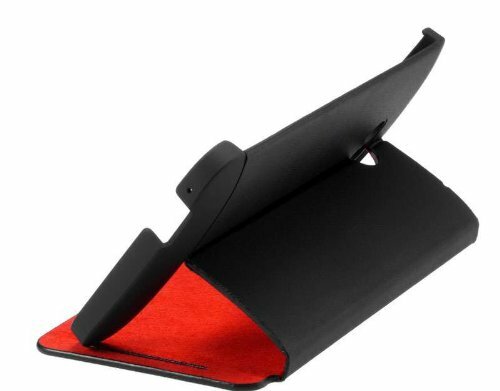 Inside is a red micro-fibre cloth material which is a soft furry feel, but nice and will help prevent scratches and also could be used to wipe the screen if needed. The phone is held quite tightly in between the polycarbonate edges and (although I haven’t tried) I would feel pretty certain that this should hold it in the case during a drop. Overall usage, is good. It stands the phone well and it’s easy to manipulate the angle. However, in doing so it does leave some ‘stretch marks’ in the folds which is understandable for the material. As mentioned by others, if you leave the phone in the standing position for too long it does leave the front flip not fully closing as the joints have obviously settled to the open position. But after a while it does close flush to the phone screen again as there is a little weight to the front cover. My only real concern is that the front flip is not locked into position, so if the phone lands face down and the flip opened during the fall you could damage the screen, so protection for this area is lacking and I would recommend buying the HTC One Screen Protector to give that additional protection. Well designed, feels like a quality product that offers ample protection for the occasional bumps that might happen. Ideal for the likes of office workers who want their phone to be stood up, or while at home to be used as a stand for media playing etc. If however you are clumsy or work in a manual industry that means your phone will be prone to drops, bumps in the pocket etc then I’m not sure this will offer a long-term solution for continuous protection. 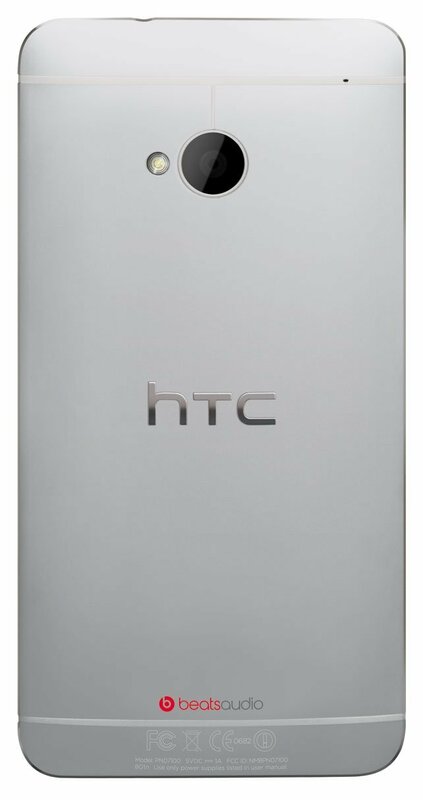 You’d be better off getting the HTC One Double Dip Hard Shell case. HTC really have done a superb job with this phone, I have been running the silver variant for 2 months now and have to say this is one of the finest phones I have used to date. Not only in design, but the Sense UI has been trimmed to give a more fluid feel and less power hungry which shows in the battery usage. So let’s start with the design; Overall from the front it looks like a sandwich of clear black in between the two silver speaker grills. And while the actual digital screen isn’t edge to edge I quite like having that 5mm black edge framing the visible screen. The top speaker grill also houses the 2.1MP front facing camera and the ambient light sensor, proximity sensor and within the left side of the actual speaker grill is where you’ll find the LED (although you won’t know this until you get a notification or put it on charge). Round the side you’ll find the volume rocker which is an almost flush ridged flat metal bar which works to keep the sleekness of the phone whilst still having that tactile feel so you can find it without looking. On the bottom is the USB port and pinhole for the mic while the top just has the headphones jack and power button. Again, the power button is made flush to the phone, so it can be slightly tricky to find/press, and I can imagine might be tricky if you have larger fingers. The other thing with the power button is it’s clear black, why is this? Well it’s also an IR blaster, this is used to transmit Infra-Red signals to a TV, Sky Box, Hi-Fi etc as the phone can also act as your remote control. On the back is where you’ll find the much talked about Ultra-Pixel camera and accompanying flash, as well as another pinhole for the rear facing mic for use when capturing video’s (in full 1080p HD). The phone in it’s entirety is surprisingly slim, and another surprise is the weight. 143g, which is just the right weight in my opinion. Not too heavy, but not light enough that you don’t know you have it. It’s a sleek design and the back is set on a slight convex so that it sits nicely in the palm and just feels natural to hold. The only downside to this is when you are lying the phone on a flat surface such as a table and typing a text or using the phone as it makes a slight wobble. The finish overall is of a high quality which would be expected of a flagship device from HTC, as with all HTC devices I’ve used I’ve found their build quality to be unsurpassable. So on to the bread and butter, usage and UI; The first thing you’ll notice once you’ve booted the phone up and gone through the standard setup process is the responsiveness of the phone. Sometimes I’m wondering if I even pressed the screen at times as I’ve gone to press an icon or shortcut and it’s opened before I’ve felt anything. It’s just so quick to respond to every gesture and press which is a far cry from anything I’ve used before… even AOSP/AOKP. You’ll also start to grasp how much the Sense UI has been trimmed down. This time you have a maximum of 5 panes to add widgets/shortcuts to and these are aligned in a row with Blinkfeed (HTC’s update to Friend Stream) taking the first pane, so really just 4 left to play about with. This time HTC have decided not to add loads of random widgets that you may or may not want to various panels, you just get Blinkfeed and the standard clock…. It’s now up to you to customise which in my opinion is better as I hated having to remove loads of widgets I didn’t want or use. This time the app drawer is made to feel like an access panel rather than an additional window to be opened and closed. So rather than the button to open, and back button taking you out and back to the home screen. You just use the menu to open, and then menu again to reduce. This can be a little confusing to start with, but you get used to not being able to use the back button to close it and it does start to feel like a better way of operating. All in all, Sense has had quite a revamp. So if you’ve used previous iterations of this skin it will certainly feel different, but in a good way! It’s cleaner, more polished and HTC have taken out a lot of the unneeded widgets, stock apps etc that just added to the drain on processor and battery. To me it’s starting to get to be more like pure android with some additional enhancements, whereas before it was a complete overlay which didn’t allow you to truly appreciate the Android OS for what it is. So what else is new? Well, HTC have added an IR Blaster into the power button. So by using the TV app pre-installed on the phone you can run a setup process to determine your, country, channels and hardware setup. Once done you can easily open the TV app, see recommended programs or all programs, press the image of the program you want to watch and it will select the channel for you. No more fighting over the remote! With the Sense TV app you can add remotes by room, so for example you could have a setup for your living room, and another for the bedroom etc. The only thing missing is I would have liked another app to be on the phone to allow you to just use the remote feature by itself. For example I have a wireless speaker which I take on holiday or outside if we’re in the garden etc and I would like to have an app which could download or learn the remote codes for this without having to worry about the TV channels etc. Have I mentioned the dual facing front speakers? This really is an impressive move. Stereo sound with a dedicated amplifier and Beats by Dre… all in a phone! It really does make a difference, and trust me you’ll know when you get a message or your alarm goes off for the first time in the morning, you may want to turn the volumes down a little. And I never thought I’d hear myself saying that about a phone speaker. Playing music through it is just a joy, no tinny poor quality sound. And if you put the volume on max, the bass doesn’t distort or feel un-natural. You really do need to hear it to believe it! Blinkfeed – In a slightly controversial move HTC have made Blinkfeed a static non-removable home screen panel taking up the first of the 5 available to you. So what is it? Blinkfeed is like a mesh of tweets, Facebook status updates/wall posts, information such as news, reviews etc from various online sources as well as upcoming calendar appointments or TV shows (if you have the TV app configured). The aim is to provide a hub for the activity which it feels would be of interest to you all on one screen. I’m not a huge fan of seeing everything my Facebook friends are doing, so I’ve set mine to just show my calendar entries and TV recommendations. But I can see this would be good for people who do like to keep on top of it all. Why no megapixels? If you haven’t already understood ultrapixels then there are some great guides as to the benefits of ultrapixels over megapixels on the HTC blog. But in essence, megapixels are great if supersizing your pictures to put on a billboard or a very large screen. But for daily usage ultrapixels offer a better clarity and image processing. This leads to far clearer images and pictures I’ve taken on my phone are in such high quality I’ve actually converted from using my Canon compact to just using the phone now as the images are actually better. The colours and clarity offered is amazing to see, especially on the HD screen you get with the One. Just another feature I urge anyone to see for themselves as you won’t get the full experience until you actually try it. One great feature, and one I use a lot is the movie highlight feature which using some clever algorithms creates a short film of an event in your gallery and combines stills & moving images to create a kind of trailer for your event. Everyone I have shown this to is massively impressed, and it’s yet another feature I’d suggest looking at for yourself to really see how good this is. Overall there are many other features and technical detail I haven’t gone into, but I’ve tried to cover off the parts which I think most people will relate to or use regularly. I can’t emphasise enough how good this phone really is. If you are due an upgrade a would urge that you seriously consider the HTC One as your next phone as it is a fantastic all-round device which offers something for everyone. Android: Does leaving GPS enabled affect my battery?